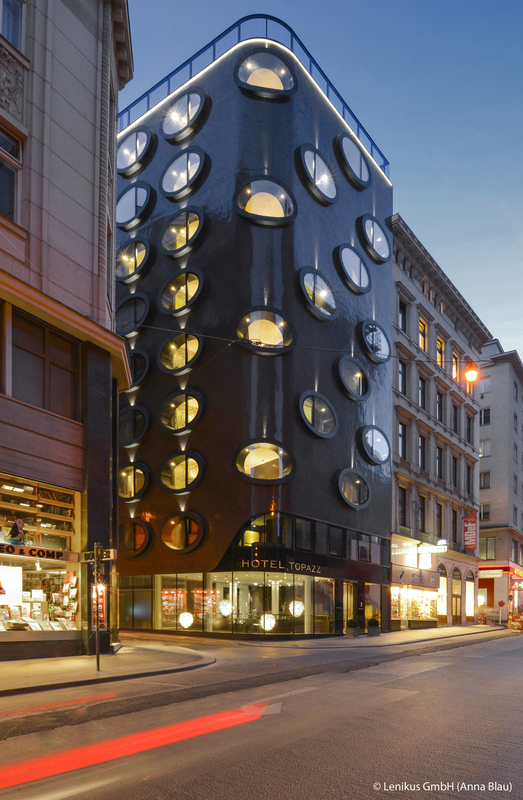 Opening this past April, the Hotel Topazz combines modern design with environmentally friendly initiatives to become the first upscale green hotel in Vienna. Located in the heart of city, its design makes the hotel almost an attraction in itself. The exterior design of the hotel is breath taking. Drawing inspiration from the past, present and future of city, the façade of the Topazz is cylindrical with oval windows staggered at different levels to align with the varying heights of the neighboring buildings. At night the windows glow an amber or topaz color on a dark backsplash giving the hotel a unique appearance. The interior of the Topazz emphasizes natural tones using ecological furnishings and natural materials. Much of the interior is decorated with dark wooden paneling and cream textures giving it a luxurious edge. Although the design of the hotel is special, the hotel was also designed with the environment in mind. The hotel has a CO2 savings of nearly 50%. This is achieved by using new technologies such as a closed heating circuit, LED lighting and triple paned glass. The natural and green initiative does not end with the hotel itself. They have been included in the day to day operations of the hotel such as the salon using organic products and serving a range of eco-friendly wine.